Easy Cherry Turnovers with Pink Vanilla Glaze are made with just a few ingredients. But what exactly are turnovers? 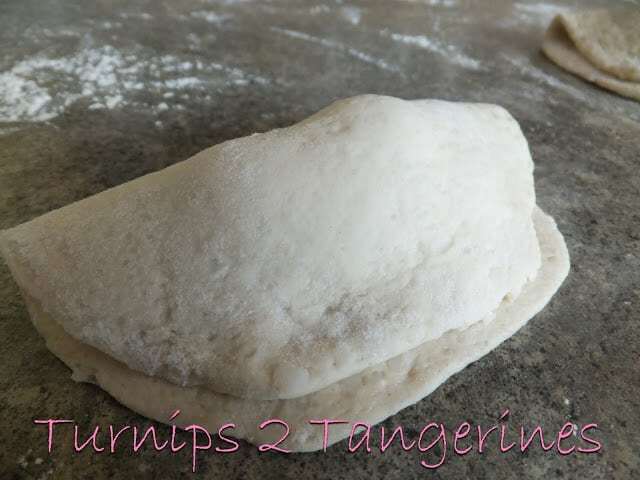 Turnovers are pastry-dough circles or squares that are covered with a sweet or savory filling, then folded in half to create a pastry in the shape of a triangle or semicircle. The edges are usually pinched or crimped to prevent the filling from leaking out. Turnovers may be baked or deep-fried. Today we are going to make cherry turnovers. They’re nice and easy and oh so good!! 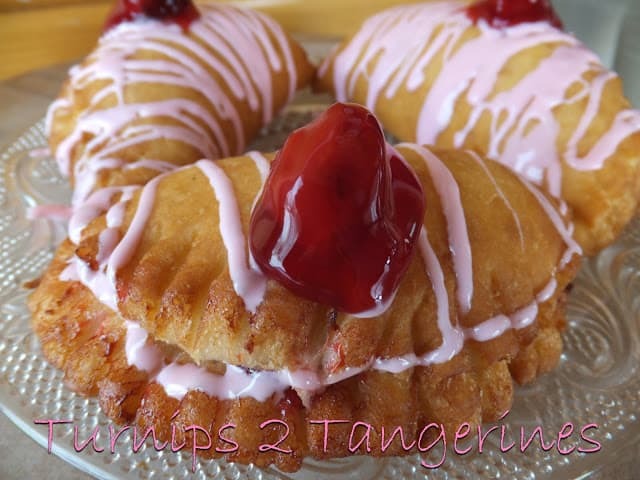 Cherry Turnovers are made with convenient products such as a can of refrigerated buttermilk biscuits, canned cherry pie filling and then drizzled with a canned vanilla frosting made into a glaze that’s tinted pink. 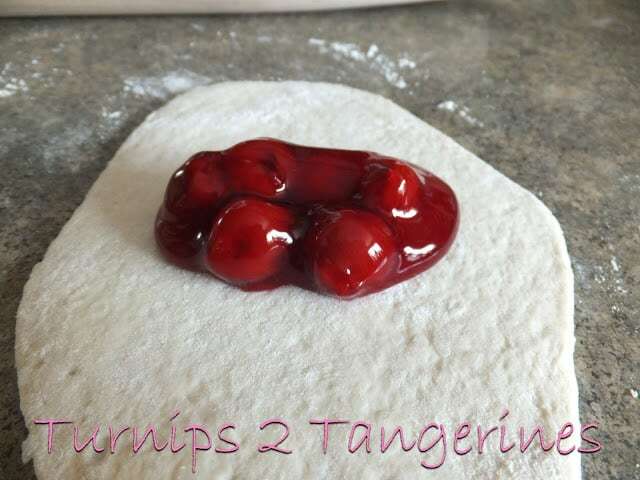 Made with only 5 ingredients, cherry turnovers couldn’t get any easier. Turnovers can range from bite-size to about 6-inches across. Cherry Turnovers are made even easier with an canned vanilla frosting. Canned vanilla frosting is combined with heavy cream until mixture reaches desired glaze consistency. Almond extract and a few drops of red food coloring are stirred into the frosting and cream mixture. 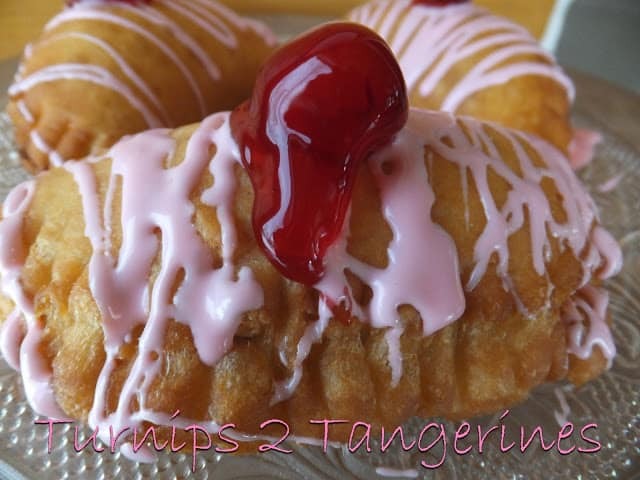 The pink vanilla glaze is drizzled over the cherry turnovers and enjoyed. Turnovers can served as appetizers, luncheon entrées or desserts. Separate biscuits; cut each biscuit in half horizontally. 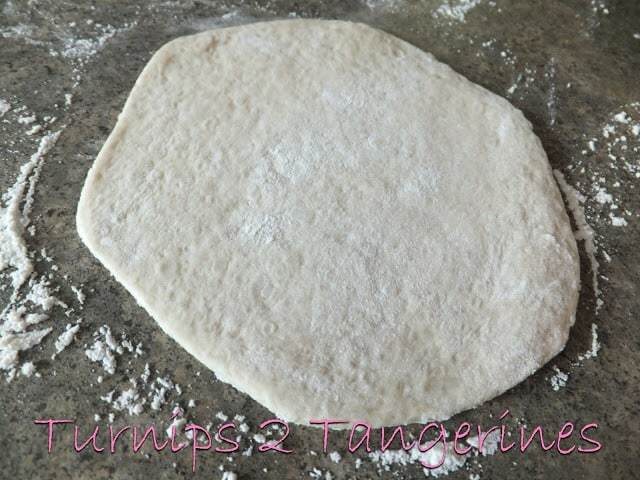 On a lightly floured surface, roll each piece of biscuit dough into a 4-inch circle. Place about 1 tablespoon pie filling onto each half circle. Fold opposite side of circle up and over filling. Brush edges with a little milk; seal edges with tines of a fork. 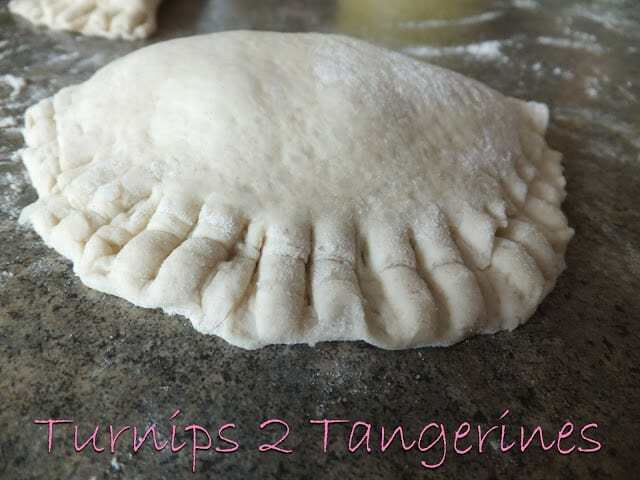 Place filled turnovers 1 inch apart on prepared baking sheet. Lightly spray with non-stick cooking spray. Bake at 350º for 12 to 15 minutes or until golden brown. Remove from baking sheet. Cool slightly on a wire rack. Drizzle with pink vanilla frosting glaze. In deep fat fryer or deep, cast iron skillet, heat oil to 350 degrees. Drop turnovers into hot oil and fry until golden brown on both sides, turning turnovers with a wire mesh spatula. Remove from hot oil to a wire rack. Cool slightly on a wire rack. In a small bowl, combine canned frosting with milk, half and half or cream. Add a few drops of red food coloring to tint frosting pink. Stir until well blended and smooth enough to drizzle. Drizzle with pink vanilla frosting glaze. Top with a cherry from pie filling, optional. For this recipe we used Pillsbury refrigerated buttermilk biscuits and Wilderness cherry pie filling. You can certainly substitute home-made pie filling or if your family isn’t fond of cherry pie filling, substitute blueberry, strawberry-rhubarb or even lemon. To make these turnovers even more special. fill them with a chocolate or vanilla custard filling. Easy turnovers are just that, easy but they are also oh so good! I love cherry turnovers! Thanks for sharing and linking back to Foodie Friends Friday! 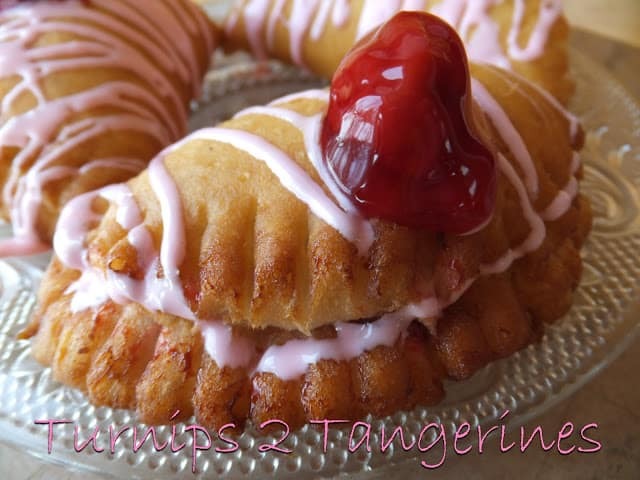 Your Cherry Turnovers look delicious, we will just love these. Hope you have a fabulous week and thank you so much for sharing with Full Plate Thursday. The girls have a snow day today–so we may be making these this afternoon! We are now following as well–have a wonderful weekend! My brother's birthday is February 22 also – these sound delicious! =) Found you at Inspiration in Progress at Clippie Dips… I'd love for you to link up at the Pinterest Power Party! These look so good! I finally got some pastry to well and truly turn out recently and I've been looking for something new to try. Thanks for stopping by and visiting earlier today. I'm following you on facebook now. thank so much for coming by and visiting- im so happy to have you and happy to be following back. Wow same day 7 years apart, nobody could plan something like that ! Happy Birthday Jan, Jim & George. Those Cherry Pie pockets look so yummy I could gobble up a couple myself I am sure. Love the sounds of that cake your Mom made too.